Flimsy is a Raleigh-area rock band which weaves an 80’s New Wave sensibility with alternative influences of the 90’s and 00’s to form its own unique sound. It’s part of the human condition to feel that the ground beneath us is shaky. Flimsy uses this universal uneasiness as an inspiration, something to laugh at, to struggle with, and to make music about. Human frailty exposed and overcome, love found and lost…these themes are woven throughout the band's original songs. Michael Daughtry is a singer/songwriter from North Carolina. 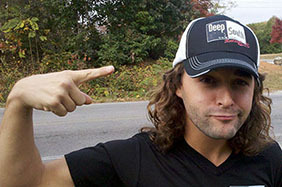 He graduated from Berklee College of Music where he received a performer/songwriter award for infectious song crafting. He gigged at the Charles Playhouse following several Blue Man Group performances in Boston. His current songs reflect the trials and joys of life. He has recently received recognition from artists such as John Ford Coley, Rosanne Barr, Luenell, Guy Torry, Jocko Sims, Bleu, and Mark Bryan of Hootie and the Blowfish.